An original design by Helen Blakey Flowers. Through the woods is a charming flower centerpiece designed to be fragrant and long lasting. 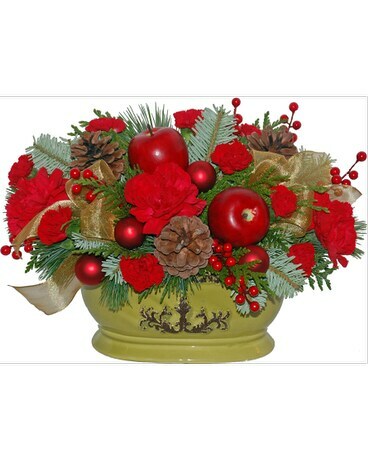 Mixed evergreens and trimmed with artificial red berry sprays and apples, pine cones, red glass balls, gold sheer bows and long lasting bright red carnations. A mix of modern sensibility with lots of traditional charm. Send one today, order online or give our flower shop a call for personal assistance. Metro wide delivery. Approx size; 26 cm W X 20 cm H. For delivery outside our Toronto flower shop delivery zone, sunstitution of similar product will be neccessary. Metro wide delivery from out Toronto flowershop includes all M postal codes as well as Markham, Pickering, Ajax, Oshawa, Mississauga and the GTA.